• Genuine U.S. Legal Tender Coins. • Authentic U.S. JFK Kennedy Half Dollar & Statehood Quarter. • Each Coin is Lavished in Precious Genuine 24 Karat Gold. • Highest Quality Colorization in the World, Accomplished Through a Revolutionary Technique. • Full-Color Certificate of Authenticity is Included with Each Coin. • Each Coin is Handsomely Showcased in an Acrylic Coin Capsule. This TED KENNEDY 2-coin complete set is a treasured collectible. Coins are Genuine Authentic Legal Tender of the United States, which have been layered in Genuine 24 Karat Gold, and then beautifully enhanced with colorized images. 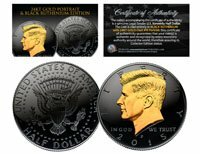 The 2-coin set includes a 24-Karat Gold Plated JFK Kennedy Half Dollar coin plus a 24-Karat Gold Plated 2000 Massachusetts Statehood quarter. Colorizing coins involves the unique application of special inks directly to the surface of a coin that achieves a level of detail, color saturation, and durability that is #1 in the coin industry. The result is an everlasting colorized coin collectible of ultra-high quality. Each coin comes in a premium coin capsule. The set comes with a Certificate of Authenticity to guaranty that your coins are authentic and recognized by every monetary authority around the world, assuring its Collector Edition status.